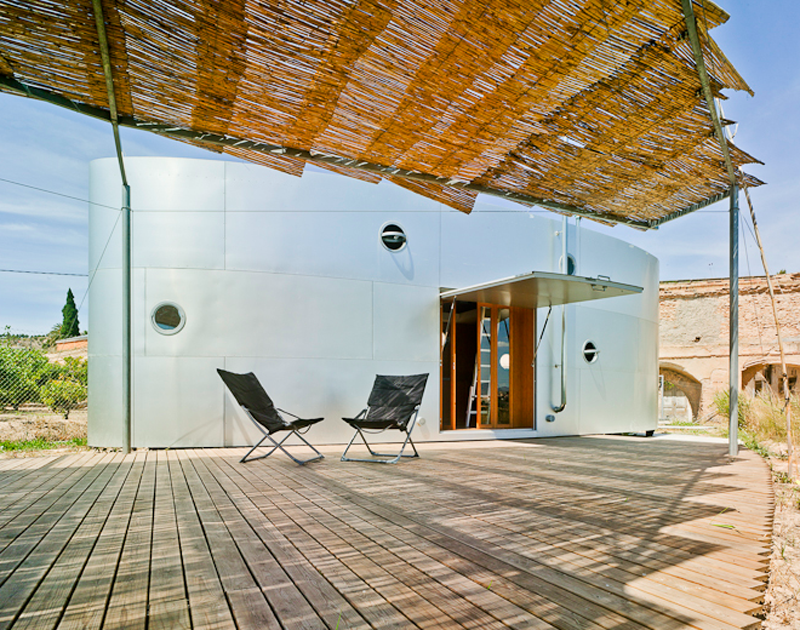 The Machine Home in Murcia, Spain, designed by adhoc ml, can be described as a cross between the traditional dwelling and the caravan. It is easily transportable and can be put up anywhere. All it needs is a minimal foundation and a connection to MEP installations, be these existing urban services or mechanisms making for the module’s total self-sufficiency: potable and irrigation water, plumbing and purifying systems, telecommunications lines and energy-capturing devices. The Machine Home has three main parts. The central area is for shared household activities. One of the side spaces contains the sanitary utilities on ground level and the other installations above. The other lateral space is a double-height storeroom. The central room has an overhead hole that the inhabitants climb up to, by means of two ladders, to get to the bedrooms. Once anchored to the ground, the module proceeds to colonize the place and interact with it through a series of added elements constructed on the site: a pergola, a terrace deck, an outdoor kitchen, a pond. They bring the interior domestic space to the exterior environment by means of a double hydraulic door system that helps reinforce the disturbing machine image of the house. Photos courtesy the architects and David Frutos.